Would you like a Digital Biscuit with your tea? 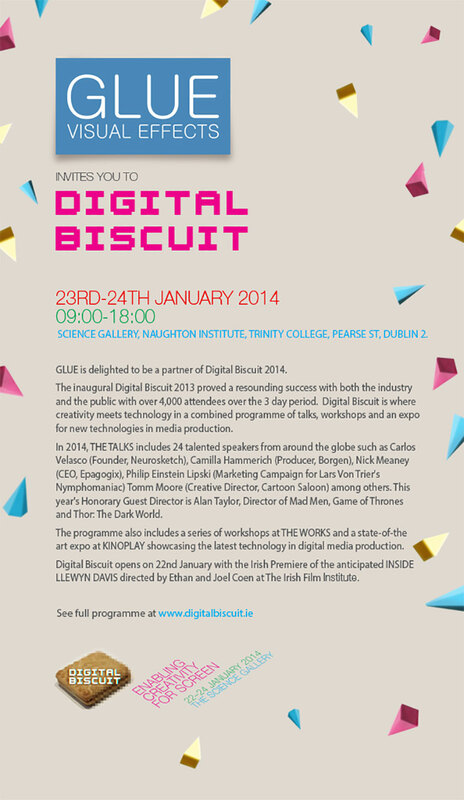 GLUE is delighted to be a partner of Digital Biscuit 2014! Digital Biscuit is an event of combined programmed talks and technology expositions over three days. National and global industry leaders will come together to ignite the creative industry by focusing on Ireland’s capabilities as a creative and technological leader in innovative film and television production. We had a great time at the VFX Summit Dublin 2013 in the Science Gallery it was a great opportunity to show our recent work. We were right next to Liam Neville Head of VFX and Glen Southern Creative Director at Egg Post Production who were involved with Last Days on Mars, Ripper Street, Sinbad, Earth bound, House of Shadows and Moone boy. Watch their VFX showreel here http://egg.ie/?portfolio=vfx-showreel they were also demonstrating the software they use NukeX, Maya 2014, Zbrush and Adobe CC. We also talked to students who had a lot of questions about the software we use at Glue VFX such as 3ds Max, After Effects, Premier Pro, Ray fire and Phoenix FD. Some of the many questions we got were about on-line tutorials and could we recommend any and the answer is yes check out Andrew Kramer VideoCopoilot.net this is a great resource and has many step by step video tutorials in After Effects and some basic 3d modelling with 3ds Max. As a student myself I used Digital Tutors which has a vast a ray of tutorials for game engines Unity 3d, UDK, Cry engine, Adobe software Photoshop, After Effects and many more amazing programs for all your Visual Effects and gaming needs. 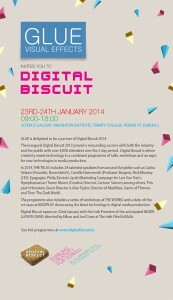 See you at the 2015 Digital Biscuit!